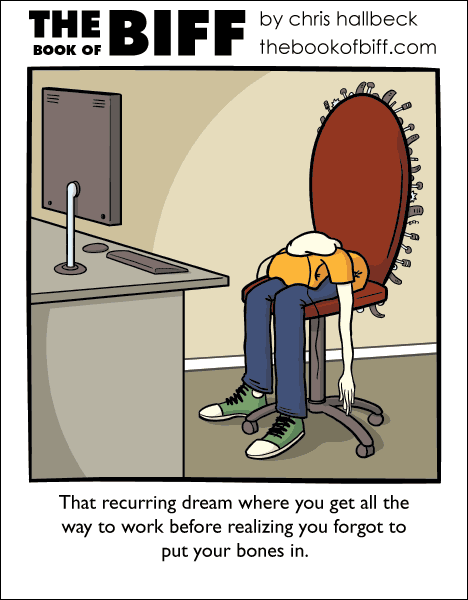 Similar to dreams people have about school I have a recurring dream about going back to my first job. I have been working there this whole time but somehow forgotten the past 10 years or so. Lots of things have moved around or changed and I don’t know what I’m doing anymore. ah, I was wondering when the chair of insanity would make a comeback. On another topic, I rarely have recurring dreams, getting a ‘rerun’, so to speak, has only happened twice I believe, and I can’t remember them very well, they were good ones though. I absolutely love my dreams, absolutely no limits whatsoever. Special effects better than hollywood, plotlines, epic stories, shapeshifting, magic, occasional visits from film/video game characters (had a fun one last night set in the Mass Effect universe), if I could I’d never wake up. That is an awesome chair. Isn’t it? Oh, and there’s that chair again! Nothing a little Bone Juice from Hogwarts wont fix. “… and I don’t know what I’m doing anymore…” Fortunately I don’t have that problem. I NEVER know what I am doing and pretty much nobody else does either. And as a result my department is the best functioning one of the entire division. I dream about my old junior high, high school and even colleges I never went to. I’ve got the weirdest boneless right now. no…no one needed too really…..
I’ve had a couple reoccurring dreams. In one I’m back in high school, only I somehow remember I’m old enough to have already graduated so I don’t have to listen to the teachers or do what I’m told. So I don’t. I also had a set of dreams where I was learning to fly. I couldn’t at the begining, but over a couple of dreams I learned how too only I couldn’t figure out how to come back down. After a while I figured that out too and now when I have a flying dream I can do it with no problem. Now I seem to have started a simular set of dreams with either teleporting or walking through solid objects. Usually after one of these dreams it takes me a minute or two after waking up to remember I can’t actully do those things. I get these weird dreams where I panic when I realize I forgot to go to work, then I wake up and remember I haven’t actually worked at that job in twenty years. Someone’s not been drinking their malk. I have dreams that seem to be set in the same town/area, but I can’t say I have had an actual reoccurring dream. One area that seems to be in a lot of my dreams is a weird version of the town I currently live in. When here, I normally have dreams about driving a car, but being unable to control it, or I’m just walking about the town and looking around. Another common spot is a seemingly endless parking lot with a single convenience store in the ‘middle’ of it. Whenever I’m here, I never seem to have enough money to buy anything. Not even a little candy bar. I almost never have recurring dreams, though my dreams often have recurring settings, most of which are kind of like messed up versions of places in real life. according to my brain, my basement has an attic (?) with almost no floor and it’s full of plants, there’s a store across the street from my house that sells spoiled food and broken stuff, and my school is a cross between what my school actually looks like and an amusement park. I have had many dreams in these places, and each time the setting is exactly the same. I don’t remember the details of any of these dreams, but I remember that whenever I have a dream that takes place in my amusement park-school thing, I am relatively self aware (whatever you call that kind of dream) and free to do whatever I want. I usually have an unbearable urge to destroy everything in that dream (I really hate that school), but I as soon as i try to smash something, my brain tells me it’s not a dream and I might get in trouble, so I usually end up arguing with my subconscious during those kinds of dreams. when my dreams don’t take place in these locations, they often take place somewhere totally random, but include elements that would relate to other dreams I’ve had. Though most of my dreams consist of arguing with my subconscious about whether the dream is real or not. anytime I have a dream that is actually GOOD (it wasn’t boring, stupid, or scary), it is ruined by something (other than waking up). for example, I once had a dream where I was rich, and had a bunch of cool stuff and I could fly, you know. all the standard-issue awesome dream stuff. However, I was being stalked by the tooth fairy (WTF BRAIN?!) and that ruined it for me. So, how many comics involving bone-loss have been posted?